WoodPro EG Roofing Nails are primary used in roofing applications where basic corrosion protection is needed. They are perfect for repair jobs and can be used for many other applications other than roofing. WoodPro Plastic Cap nails are great for house wrap, foam board, felt paper and other soft materials that require a large head to hold down the material without damaging it. Our bulk plastic cap nails have a 1" plastic head with a ring shank to help prevent back-out over time. They can be hand driven or driven with a pole hammer. WoodPro Sinkers are vinyl coated for easy driving. After the nail is driven the vinyl coating hardens to provide increased holding power to help prevent back-out. These nails should only be used for interior applications where no corrosion protection is needed. WoodPro Common nails are used for every day interior framing where no corrosion protection is needed. The top shank of the framing nail has deep rings to increase holding power and prevent back-out. WoodPro Duplex nails are used for temporary structures where the nail needs to be easily removed at a later time. Our duplex nails have a bright finish and are for interior use only. WoodPro Finish Nails are used where the head needs to be hidden from display or easy to cover up. They are generally used for trim and moldings and should only be used for interior applications where no corrosion protection is needed. The head of the nail is only slightly bigger than the shank and the ridges help prevent back-out. WoodPro Masonry Nails are hardened to prevent breaking and bending while they are driven into concrete or mortar joints. The bright finish should only be used in interior applications where no corrosion protection is necessary. WoodPro Pole Barn Nails are used where a long, strong shank nail is required. Our pole barn nails have deep rings for increased holding power that also help prevent back-out over time. These pole barn nails are heat treated for extra strength. They should only be used in interior applications where no corrosion protection is necessary. WoodPro HDG Polebarn Nails are used where a long, strong shank nail is required. Our pole barn nails have deep rings for increased holding power and helps prevent back-out over time. These pole barn nails are heat treated for extra strength and are primarily used for exterior applications. The hot dip galvanized coating helps prevent corrosion over time. 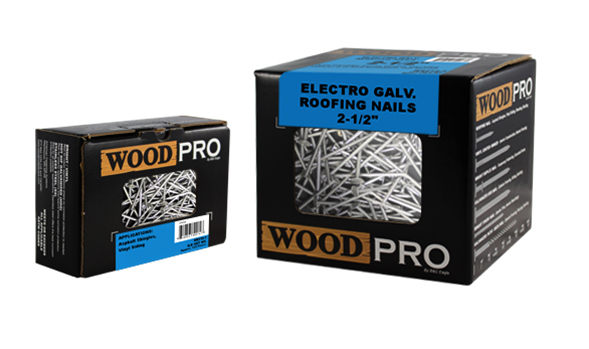 WoodPro Box Nails have a rough hot dip galvanized coating that is mainly used in exterior framing and decking applications. Hot dip galvanizing helps prevent the nail from corroding over time. Ridges at the top of the shank help prevent back-out over time. WoodPro Patio/Deck Nails are great for exterior decking and siding applications where strong holding power is necessary. The rough screw shank provides increased holding power in hard wood types. The hot dip galvanizing coating helps prevent corrosion over time. WoodPro Casing Nails are used in exterior applications where the head of the nail needs to be hidden or easily covered up. The hot dip galvanizing helps prevent corrosion over time. The rough shank and ridges at the top of the shank help prevent back-out over time. WoodPro Joist Hanger Nails are mainly used for joist straps and metal connectors where a strong shank is necessary for strength. These joist hanger nails are hot dip galvanized to help prevent corrosion. The rough shank resists back-out while the sharp point eases driving. WoodPro HDG Masonry Nails are hardened to prevent breaking and bending while they are driven into concrete or mortar joints. The hot dip galvanized finish helps prevent corrosion over time. WoodPro Drywall Nails have a phosphate coating for easy driving and some corrosion protection. The annular thread and coarse shank helps to secure itself in the drywall to help prevent pop-out over time. Drywall nails should only be used in interior applications and not in treated lumber.